Leadership Up Close #26: Do You Want to Know Who’s Who? Has this pigeon nailed it? 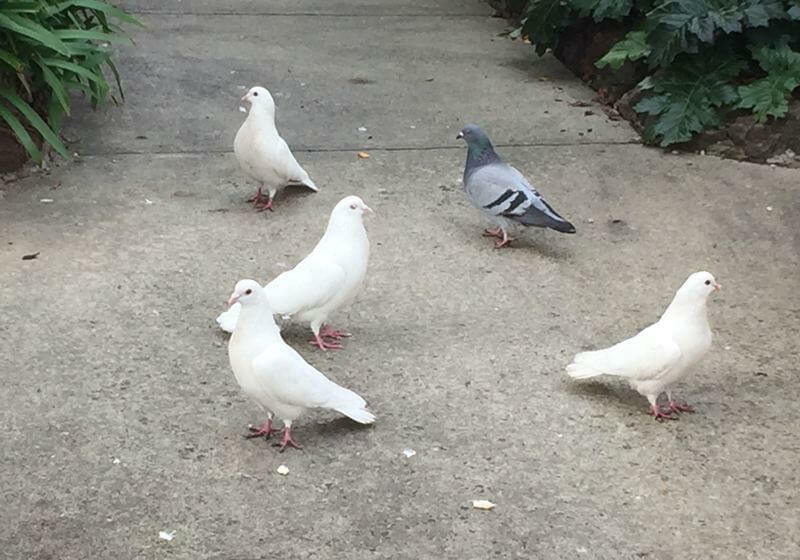 She’s standing out from her white-feathered friends, and at the same time, she belongs to this Party of Five. That’s what you want. To be part of the in-group… and to stand out from the crowd. The question is how. And that depends on whether you need to work on fitting in or standing out. According to researchers at Stanford and the University of California, if you’re a cultural misfit you’ll want to belong to a tight network – where most people know each other. That’s because there’s more internal trust in closed groups. Once you’re part of the group, your quirkiness will be endearing rather than a reason for rejection. But if you’re a cultural fit, then you’ll do better if you provide a bridge between tight networks. Your value-add is through sharing information across group lines, helping break down the silos. This is a time when it pays to talk to strangers. Before you can work out whether to work on fitting in or standing out, you need to know who’s who… and who knows who in the zoo. And your place, where you fit. It’s brilliant ROI. According to Ronald Burt, executives who learn the network structures in their organisation are 36-42% more likely to improve their performance and 42-74% more likely to be promoted.